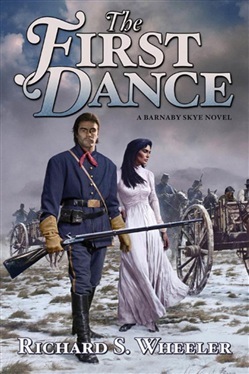 The First Dance takes beloved mountain man Barnaby Skye's family to its third generation in North America. Miles City, Montana. 1885. Barnaby Skye's mixed-blood son, Dirk, has just married a beautiful Metis girl, Therese. But Dirk's position as a civilian translator for the U.S. army threatens to shatter their union. Montana ranchers wrestling with livestock theft and the incursion of settlers into their range have persuaded the army to send the Metis people back to Canada. The military enlists Dirk to translate between the two sides in the brutal campaign. Unable to reconcile her love for Dirk with the pain he is inflicting on her people, Therese flees on their wedding night. Heartbroken, Dirk rides off with the army. Therese has a powerful vision. She is inspired to build a church that will be a gathering place for her people and a symbol of their resistance to deportation. The suffering refugees--driven into the wilderness by Yankee soldiers and cruel ranch vigilante gangs--find a friend in Dirk and an inspiration in Therese. In their common cause, the lovers are reunited At the Publisher's request, this title is being sold without Digital Rights Management Software (DRM) applied. Acquista The First Dance in Epub: dopo aver letto l’ebook The First Dance di Richard S. Wheeler ti invitiamo a lasciarci una Recensione qui sotto: sarà utile agli utenti che non abbiano ancora letto questo libro e che vogliano avere delle opinioni altrui. L’opinione su di un libro è molto soggettiva e per questo leggere eventuali recensioni negative non ci dovrà frenare dall’acquisto, anzi dovrà spingerci ad acquistare il libro in fretta per poter dire la nostra ed eventualmente smentire quanto commentato da altri, contribuendo ad arricchire più possibile i commenti e dare sempre più spunti di confronto al pubblico online.